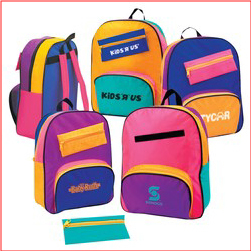 These colorful Kids Backpacks can be customized with your school logo, your team logo, or more. Great for Pre-schools, Camps, and daycare programs. These sturdy nylon packs come with a matching zippered pencil pouch. Use these backpacks as a school fundraiser!